Construction continued recently on townhouses in Murrayville. While the prices of Langley houses, townhouses, and condos have leveled out of late, they jumped, on average, 30 per cent from November 2015 to this past November. The good news for Langley homebuyers is, price-wise, the local real estate market has stabilized over the past few months. Even so, the benchmark (average) price to buy a house, townhouse, and condo in Langley is significantly higher than it was just one year ago. The most recent stats released by the Fraser Valley Real Estate Board (FVREB) show that the benchmark price for a detached home in Langley was $871,600 in November. That’s down 1.4 per cent in price from three months previous. But it was still 30.9 per cent more expensive to buy a house in Langley compared to November 2015, and a whopping 72.7 per cent pricier than 10 years ago. Michael Thorne has worked as a real estate agent in Langley for the past 23 years and predicts a balanced, steady, and stable market for the next number of years. He noted that affordability pressure combined with the foreign buyer tax affecting Metro Vancouver real estate transactions has helped cool the market. Peaks and valleys in Langley’s real estate market are nothing new. “There was a period of time from (19)95 to ’99 when nothing happened. Prices didn’t go up, prices didn’t go down, and then the market ramps up for a short period of time and we see these jumps,” Thorne said. 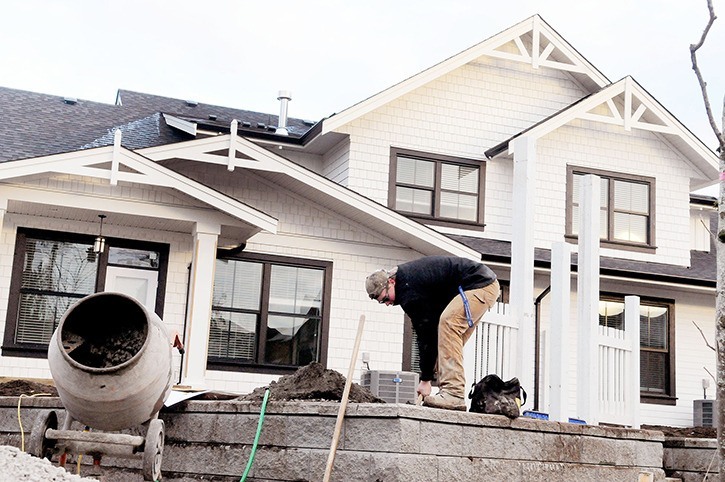 With the prices of detached homes in Langley soaring to levels that are beyond many buyers’ collective reach, Thorne has seen his clients’ expectations shift. This makes Langley townhouses a realistic option, and that market has followed a similar pattern as detached homes, with the benchmark mark price of $473,100 inching up 0.6 per cent from three months previous. And, if you go back to November 2006, townhouses have jumped 55.9 per cent in price. Langley apartments continue to be a popular choice, at a relatively affordable benchmark price of $265,800. That’s up 2.9 per cent from three months previous, 27.3 per cent from November 2015, and 26.9 per cent from 10 years ago. Relative affordability continues to drive the condo market, locally. Seventy apartments changed hands last month, a 27.3 per cent jump from the previous November. However, this marked a 6.7 per cent dip from this past October, when 75 condos were sold in the Langleys. The decline of house sales (82 in November) is noticeable, down 25.5 per cent from the same time last year and 5.7 per cent from October. And when it comes to Langley townhouses, the 72 sold last month signified a 7.7 per cent decrease compared to the same month last year, and 8.9 per cent fewer than October. The FVREB processed 1,247 sales of all property types on its Multiple Listing Service in November, a decrease of 29.4 per cent compared to November 2015’s 1,766 sales, and a 14.8 per cent decrease compared to the 1,463 sales this past October. Of the sales processed last month, 291 were townhouses and 348 were apartments, representing more than half of this November 2016’s market activity. “Through the past four months, we’ve seen a slow but steady return to a more normal market for sales and listing activity,” FVREB president Charles Wiebe said.